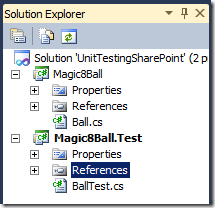 Part 1 — SharePoint Retreat–TDD and Unit Testing, the methodology used. Because of the length that this will turn into, Iâ€™m going to break it into several posts. Part 2 – SPRetreat TDD and Unit Testing, the methodology used cont.. These rules, coupled with the Red, Green, Refactor (see later) aim to produce lean readable code. The aim of the day is to write a web part for SharePoint that contains a magic 8 ball. Youâ€™ll be able to ask it questions and the Magic 8 Ball will automagically select the answer you need from a SharePoint list. In order to make the unit testing possible and also to improve the experience, Iâ€™m using several tools recommended by Andy for the day. NUnit provides the actual unit testing framework, without it we wouldnâ€™t have our unit tests. There are other options such as MSTest available. Resharper V5 â€“ Provides the refactoring tools (plus other functionality), Some of which is already available in VS2010. This is my first time using it, but I quite like it. Takes some getting used to. TestDriven.net â€“ This is a VS2010 plugin that makes the process of testing easier, for instance tests can be run by key press and the output sent to the Output window rather than a pop up GUI. Itâ€™s all about speed remember. TypeMock â€“ Mocking and isolation framework. Frankly if you want to truly isolate the SharePoint part of your SharePoint code, TypeMock is probably going to be a must. Without it, the amount of isolation you can do is reduced, but not removed entirely. The unit tests themselves have been written in the following form and I made sure that through the day I used the //Arrange //Act //Assert tags throughout to remind me where I was in the test and what Iâ€™m doing..
As the retreat was about developing good skills and muscle memory, we did several sessions during the day, REPEATING all the steps from the previous session, each time progressing further down the road to our finished product. Following each session, in a true Agile fashion we held a retrospective and reviewed each others code. This was invaluable as seeing several peoples view points on the tests did open your eyes to other possibilities. 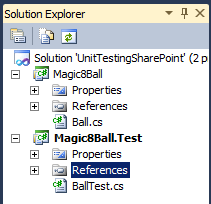 The code Iâ€™m going to develop whilst posting this blog will hopefully take us all the way to a finished SharePoint web part that utilises the Magic 8 Ball TDD code. On my SharePoint VM, Iâ€™ve fired up Visual Studio 2010 and created an empty Visual Studio Solution. To this Iâ€™ve added 2 projects, The first is my Test code and the second is my Production code. Andy suggested that we use this method with the Production code sitting in the parent namespace and the test code sitting in Parent.Test. Each namespace then contains the relevant named class E.g. Parent.Ball and ParentTest.BallTest. Add a reference to NUnit.Framework.dll in your test project. Add the attribute [TestFixture] to your BallTest class. Youâ€™ll note that of course Visual Studio isnâ€™t aware of this attribute, however Resharper is aware of your referenced objects and highlights the suggestion to you. Click on this and the relevant using statement will be added. 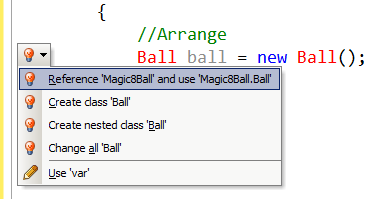 If youâ€™re typing this through yourself, another Resharper helper pops up when typing the //Arrange part out. We havenâ€™t told the test class about the actual production code yet, so when we try and reference it, we canâ€™t. Note: A TDD purist would point out that I shouldnâ€™t have created the Magic8Ball production class until Iâ€™d written a test that failedâ€¦ Erm, Iâ€™m beginning at this and getting my head around it..give me a break..
Now that weâ€™ve got an object to play with, Weâ€™ll start with our first action and call the balls AskQuestion method with a simple string. Wait a minute, weâ€™ve got what would be a compile error! Thatâ€™s a failed test.. weâ€™re getting into true TDD territory now! Using Resharper, weâ€™ll create the method that weâ€™re calling. VS2010 will switch to the production code and youâ€™ll find that we now have our method, complete with return type, parameters and Not Implemented Exception. Test 'Magic8Ball.Test.BallTest.Ask_Question_ReceiveAnswer' failed: System.NotImplementedException : The method or operation is not implemented. 0 passed, 1 failed, 0 skipped, took 0.44 seconds (NUnit 2.5.5). Remember, weâ€™re sticking to the precept of typing only enough code to fix each test as it fails. We could have changed the "Throw new Not Implemented Exceptionâ€ statement, but then weâ€™d be breaking the rules! So as expected, our test fails. Switch to the production code, we now write only enough code to fix the test. 1 passed, 0 failed, 0 skipped, took 0.52 seconds (NUnit 2.5.5). So, weâ€™ve failed a test, then passed a test, so using the Red, Green, Refactor rule, we need to look and see if any of the code could be refactored to make it easier to read. As weâ€™re on such a short piece of code now, thereâ€™s only one thing that needs amending and that’s the parameter placed in the AskQuestion method, Variable names really need to be meaningful, so weâ€™ll change that â€œsâ€ to be â€œquestionâ€. Youâ€™ve just written your first bit of test driven code.. but weâ€™re not done yet, Weâ€™ve got to get this Magic8Ball class written and tested (Or should that be tested and written? ), then we need to get it into SharePoint.